Quartet 851 premium 4' W x 4' H conference room cabinet features an enclosed whiteboard surface with projection screen. Added function through tackable fabric panels inside each door for posting materials. Deluxe cabinet styling adds elegant professionalism. 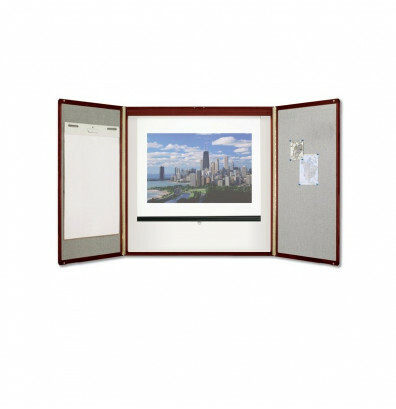 The ideal wall mounted presentation tool for any conference room or personal office environment. Recommended for heavy use. The Quartet 851 conference room cabinet combination whiteboard offers a durable magnetic DuraMax porcelain steel markerboard surface that is scratch, dent, stain, and ghosting resistant. Fabric panel tackboard inside each door allows for tacking on of support materials like reference documents. 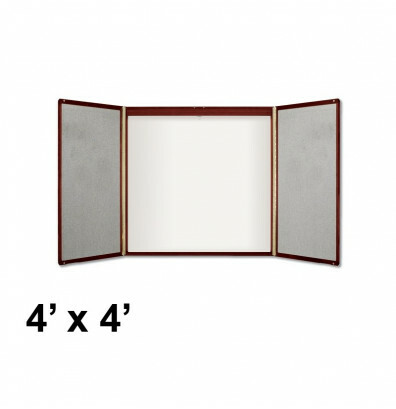 Includes flipchart holders to attach flipchart to fabric panel. Retractable fiberglass projection screen provides a clear surface for projector use. The premium cabinet combination whiteboard is constructed with long-lasting mahogany veneer finish wood. Elegant matched-grain doors feature radius edges and full-length hinges. Magnetic doors shut securely with minimal effort. Accessory marker ledge within cabinet provides added storage space for whiteboard supplies like markers and erasers. Durable DuraMax porcelain steel surface accepts magnets. Writing surface is scratch, dent, stain, and ghosting resistant. Retractable projection screen handy for projector presentations. Fabric bulletin tackboard inside each cabinet door for posting materials. Magnetic cabinet doors close easily. Accessory marker ledge for added board supplies storage options. Sturdy mahogany veneer finish wood construction. Mounts horizontally to wall for static, reliable use. Includes flipchart holders, 4 color dry erase markers (1 red, 1 green, 1 blue, and 1 black), eraser, magnets, and wall mounting hardware.